The Reverend Martin Luther King Jr. This is a post about being a Christian. Today there are a lot of people writing a lot of posts and articles about the Reverend Martin Luther King Jr.
And well they should. He was a great man whose vision, oratory, writings and tireless work inspired a nation to turn away – albeit slightly – from bigotry, racism and hatred. And it is his social and political accomplishments that you’ll likely read most about today and tomorrow. His speeches. His marches. Lunch counters. Protests. Non violence. But I want to remind others – as I remind myself – that Dr. King was a Reverend. A preacher. A man of faith. A Christian. Funny how most of us gloss over that. Read the book. If only a chapter or two. And if you do I challenge you to try and divorce Dr. King’s vision of a world where ‘a man would be judged by the content of his character, not the color of his skin’ from his Christian faith. Read Dr. King. And be reminded of the real meaning and spirit of the Christian faith. You might find it very different from the Christian faith you see in popular culture or hear in political dialogue. Jesus said that if we have the faith of a mustard seed we can move mountains. Dr. King’s faith moved an entire generation. Read Dr. King. 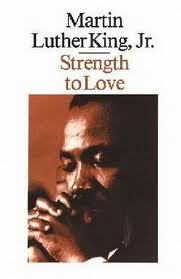 And pray that more will be inspired to, like Dr. King, recapture the revolutionary loving spirit of the Christian faith.